In a large 8-cup glass pitcher, add a tray of ice cubes, then add the two juices and the ginger beer and thinly sliced fresh ginger root. Stir together. 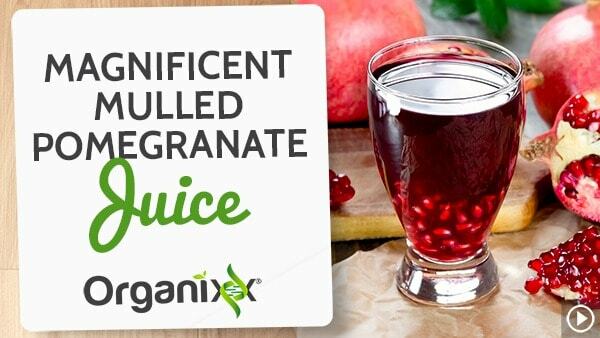 Pour into glasses, squeeze in a little lime juice, and garnish with mint leaves and fresh pomegranate seeds. In a large saucepan, add the pomegranate juice, then the cinnamon, cloves, rosemary sprig, and orange slices. Bring to a simmer then turn off heat, cover, and let mixture sit and infuse for 30-60 minutes. Reheat just until hot if you wish to serve beverage hot. Strain off “chunky” bits by pouring through a strainer into a serving pitcher. Add one drop of lemon or orange essential oil and stir to combine. 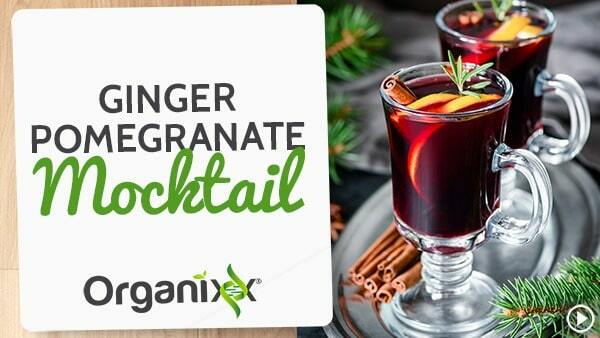 In a large saucepan, add the pomegranate juice, then the cinnamon, cloves, rosemary sprig, and orange slices. Bring to a simmer then turn off heat, cover, and let the mixture sit and infuse for 30-60 minutes. Add one drop of Organixx lemon or orange essential oil and stir to combine. Serve and enjoy!